More than 96% of cases reported to the UK’s national fraud reporting centre Action Fraud go unsolved, exclusive Which? Money analysis can reveal. Less than one in 20 crimes handled by Action Fraud result in a suspect being charged, cautioned or dealt with some other way by the justice system, according to official statistics. Our Which? investigation reveals the low-rate of success for solving fraud cases and explains how Action Fraud works, and what to do if you’re targeted. Exclusive Which? research found that less than 4% of crimes reported to Action Fraud are solved, and probably much less. Our estimate is based on two statistics. 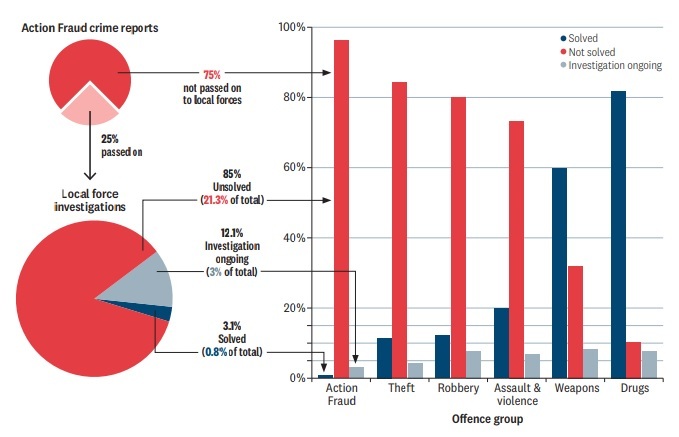 The first is the proportion of crimes reported to the Action Fraud, which are then forwarded to local police for investigation. This can be worked out by comparing the number of Action Fraud crime reports against the number of forwarded cases in each year, which are published annually. Around 25% of cases have been forwarded in the last four years. That means 75% of Action Fraud crime reports are closed unsolved without ever being sent to a local force for investigation – typically because there is no viable line of enquiry. The second – and crucial – figure relates to how many fraud investigations local police are solving. This cannot be found in routine publications, making it unique among crime groups. Furthermore, we don’t feel this lack of transparency has been explained adequately. But we unearthed some data tucked away in the appendix of a written submission to the Home Affairs Select Committee by the City of London Police. It showed that in 2016-17, local police solved 3.1% of fraud cases, while 85% were unsolved, and in 12.1% of cases were ongoing. Comparing our research with other crime statistics shows that police solve significantly less fraud cases than any other crime group. Alarmingly this comes as fraud offences continue to rise. UK residents are now more likely to be victims of fraud and cyber crime than any type of offence, according to the ONS. Fraud and cyber crime offences are now ten times more common than burglary. 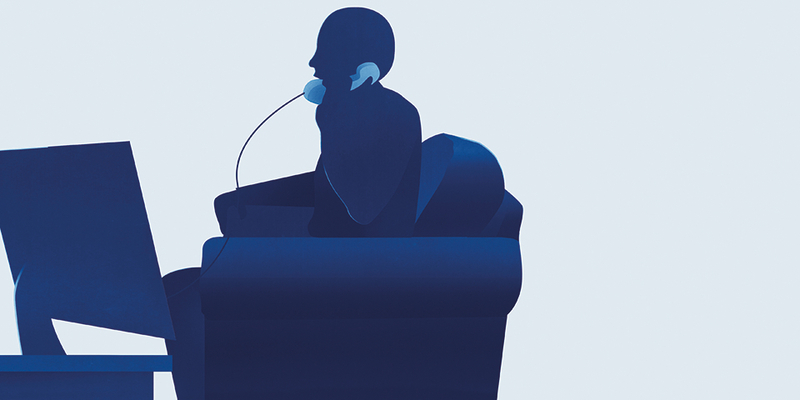 A scam carried out online or over the phone can snare victims right across the country. For this reason, a centralised fraud-policing system was established in 2009. Action Fraud, and its sibling agency, the National Fraud Intelligence Bureau (NFIB), are at the heart of this process. Both are branches of the City of London Police, which has expertise in battling economic crime. 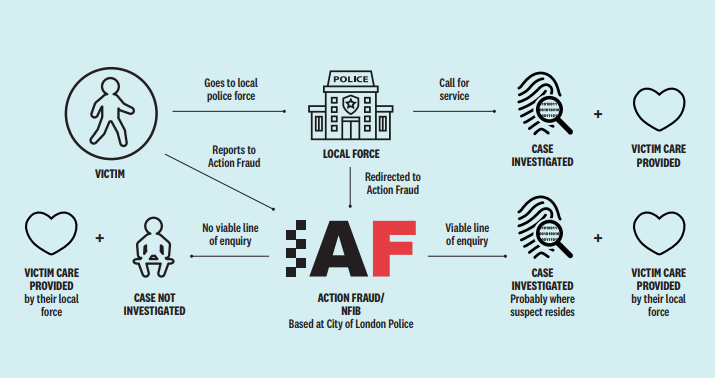 Most victims of fraud in the UK should report an incident directly to Action Fraud. Individual reports are then passed on to the NFIB, where connected crimes are pooled into a single investigation package. The NFIB doesn’t go after offenders. Instead, it assesses whether there is a viable line of enquiry and, if so, forwards the investigation to another agency. In most cases, this is a local police force, typically the one where the suspect resides. How are local police tackling fraud? Which? Money sent Freedom of Information requests to local police forces, asking them about the outcomes of fraud investigations conducted in the last four years. We received responses from 30 of them. The data was messy and inconsistent in some cases, so it would be unfair and inaccurate to compare local forces based on what they sent back. However, the responses we received show a general decline in police performance against fraud at almost every force. Nearly all of them saw their solved rate fall by more than 20% between 2014 and 2016, while 10 of them saw performance fall by more than 40%. The local police force figures look much healthier than our “less than 4% solved” discovery because they do not include the 75% of cases that the NFIB never forwards on. In addition, these figures may include frauds directly acted on by local police without being forwarded on by Action Fraud, further explaining inconsistencies with our main analysis. Why are so few fraud cases being solved? To start with, fraud is difficult to investigate because offenders are often ‘invisible’. More and more of our financial transactions take place on the internet, so criminals have set up camp online. The Office for National Statistics (ONS) estimates that around 55% of frauds have a digital element. Although investigators may have cutting-edge technologies to track down online or telephone fraudsters, it’s an uphill struggle. The offender might not be based in the UK, and there may only be a social media account or web address to look into. In contrast, a detective working on a robbery investigation will have a head start if there are eye witness reports and CCTV evidence – or if an offender is caught red-handed, as they typically are in weapons and drugs cases. These difficulties are compounded by the reality that police forces must prioritise. Fraud can be a devastating, life-changing event for victims. But this has to be weighed against the threat, risk and harm of other offences, including violent crime. To make matters worse, police budgets and officer numbers have been significantly cut in recent years, and officers say this has had an effect on their ability to deliver justice. But the City of London Police emphasises much of its work goes beyond catching criminals. It also disrupts websites, telephone numbers and bank accounts linked to fraud. Detectives interviewed by Which? were also keen to stress the increasing role local police play in victim care. The ONS estimates that 15% of bank and credit card fraud victims have been successfully targeted before. Providing appropriate care and advice to a victim in the aftermath of a fraud is therefore crucial to preventing further crimes. The NFIB provides all local forces with profiles of specific groups deemed vulnerable to fraud within their jurisdiction – these can be used to safeguard at-risk groups. If you’re the victim of fraud, it’s important that you inform law enforcement. This is vital to helping investigators to build as complete a picture as possible of the UK fraud threat. In most cases, you should go directly to Action Fraud – you can report online, or by calling 0300 123 2040. You should also do this if you have information that could help local police identify a fraudster. For more information, you can read our guide to reporting a fraud. We also explain how to spot a scam and how to get your money back if you fall victim.